Hi, I am interested in your 1975 Plymouth Duster (stock #4695-ATL) listed on Autotrader for $21,995. I'd like to get more information about this vehicle and confirm its availability. Its a great example of MoPars mid-70s style in a very well-restored form. This 1975 Plymouth Duster is looking sharp and running great, with plenty of enhanced power under its hood and a nice array of mechanical upgrades on board to provide a great driving experience to go along with plenty of curb appeal. 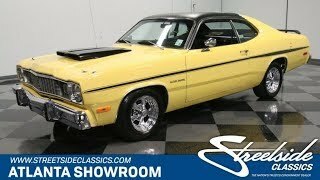 Plymouths Duster holds a distinct history, in that while it was brought out to add its semi-fastback style to the Valiant line, its a markedly different car from the cowl on back while retaining that familiar MoPar front end. Decked out in a suitably vintage-looking shade of yellow, this 75 is a fine looking specimen of the model. The paint itself has a really nice shine and a consistent smooth texture and the contrasting black of the hood scoop and rear spoiler provide a period authentic appearance, as quite a few Dusters left the factory with this two-tone color scheme. In this Dusters case, that hood scoop is there for more than just looks - its fully functional and ushers cold, dense air to the engine waiting just below. The recently replaced black vinyl top adds still more 70s flair to the equation and was obviously installed at the hands of professionals, so it fits nice and snug. In all respects, this is a very solid and very vital-looking classic - its assembly of chrome is in very strong condition and the body alignment is uniformly precise, with nice even gaps surrounding the doors, hood and deck lid. Check out how even those black side stripes are as they run from front to back. The interior retains the same factory style it began with and is in very clean condition, with black vinyl seating in both front and back and a pair of door panels to each side that present very well. Both the headliner and carpeting were recently replaced, with the latter sporting a pair of floor mats up front bearing the instantly recognizable Duster logo. Just beyond the GT Grant steering wheel, the dash has been well protected by its matching black Velcro cover - youll find no splits or warpage on the pad below it and the assortment of factory gauges in the instrument cluster look nice and clear. Below, SunPro oil pressure and temperature displays have been added to keep a read on those vital motoring functions. The added modern air conditioning system is blowing very strong through its set of underdash vents - fire it up and it will cool the cabin down in no time. The aftermarket center console is another welcome addition, offering plenty of storage space and a pair of cupholders. A 318 cubic inch V8 sits in place of the original 6-banger, offering considerably more power than its predecessor could. Its been armed with a nice assortment of upgrades to boost its output even further without sacrificing drivability, including a Weiand mid-rise intake manifold, a 4-barrel Holley carb and a mild performance cam. The Mallory ignition maximizes available spark while the sizable aluminum radiator upfront carries its own electric fan to keep temperatures under control. The powerplant is running strong, offering a nice subtle lope as it pairs with an automatic transmission that shifts with smooth precision. Power steering makes for easy navigation, while front disc brakes help bring this sharp-looking Plymouths set of Cragar wheels - 14 in front, 15 in back and wrapped with Hankook tires - to dependable, fade resistant stops. This 1975 Plymouth Duster looks as fresh as can be and its rock solid running condition is a huge plus. Call today!